A true delight! 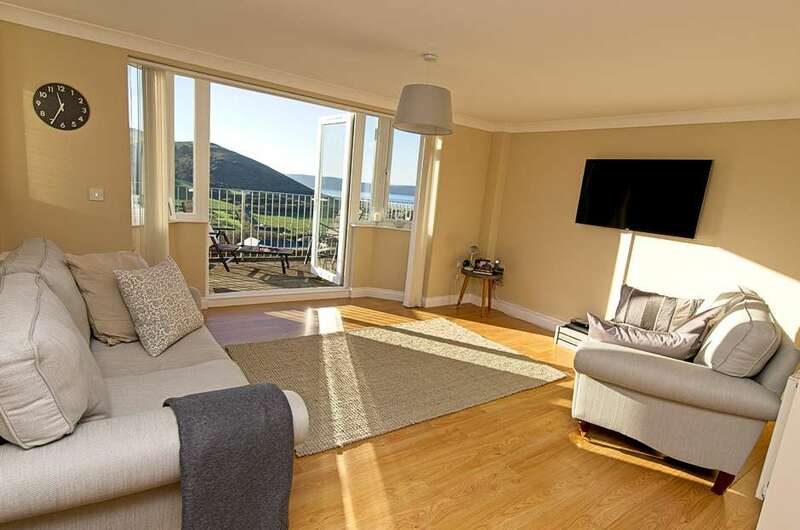 This beautifully presented two bedroom apartment has gorgeous views both to the rolling hills that fold down to the dunes above Woolacombe Beach and of the entire bay of Woolacombe from Baggy to Morte Point. It’s also just a 5 minute walk to the village and a couple of minutes more to the beach. Sleeping four in two lovely bedrooms, we think this apartment will prove to be really popular all year round. There is parking in front of the apartments for one car in an allocated marked space and further parking around the back. The outdoor steps lead to the main door into the communal hallway. Driftwood is on the first floor up one flight of dog legged stairs. The main living area is at the front with a large living room facing south through the patio doors onto the wide balcony where the best of the views can be enjoyed. This sunny room has two sofas, a large wall hung TV, music speaker and folding dining table and 4 chairs. This apartment has Wi-Fi. In the kitchen which is at the rear of this room, there are 2 bar stools, 50/50 fridge freezer, full size dishwasher, washer dryer, cooker, hob, extractor and microwave. Usual kitchen crokery and utensils are supplied. Down the corridor to the rear of the apartment are the two bedrooms, One is double with en-suite shower and the other has two single beds. There is a family bathroom. Both bedrooms are bright and well presented. We love this pretty apartment and feel that it represents all one could wish for in a UK holiday home by the sea.